The September CAA News has just been published. With the newsletter back in print, individual and institutional members will receive a copy in the mail next month; the newsletter is also available immediately as a PDF download. The September issue celebrates the tenth anniversary of caa.reviews, the online journal that launched in fall 1998. Also, in preparation for the 2009 Annual Conference, the issue contains an article on the hottest contemporary art galleries downtown in Los Angeles, including those in Chinatown. A number of important deadlines for participation in CAA activities also appear: calls for nominations for editor-in-chief of Art Journal and reviews editor of The Art Bulletin (September 15); for conference travel grants (September 26); for applications for graduate-student fellowships (October 1); and more. The deadline for submissions to the November issue is September 10; please send them to Christopher Howard, CAA managing editor. If you wish to receive CAA News in electronic format only, please contact CAA Member Services. The awards ceremony will be held at the Wilshire Grand Hotel in Los Angeles on Saturday, February 28, 2009, in conjunction with the CAA Annual Conference. This ceremony, which is free and open to the public, will be the thirtieth anniversary of the awards. As in past years, the awards ceremony will include an accompanying catalogue, outlining the awardees’ accomplishments in greater detail. Please check the WCA website for more details about the ceremony (free), the awards dinner (tickets are $90 before December 1, 2008, and $105 after), and other planned events. 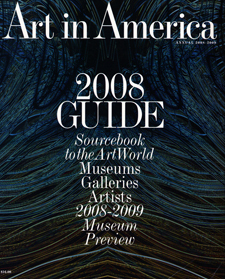 Art in America’s 2008 Annual Guide to Galleries, Museums, and Artists hit newsstands earlier this month, with museum previews for the 2008–9 season as well as a look back at notable events and people of the past year. The “People in Review” section features Yoko Ono, Robert L. Herbert, Chris Kraus, and Sylvia Sleigh as honored recipients of CAA Awards for Distinction. The awards were presented in February 2008 at the CAA Annual Conference in Dallas–Fort Worth. Download the Art in America feature; also, see the full list of 2008 award recipients. 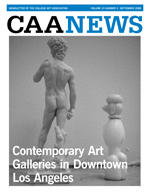 CAA invites nominations and self-nominations for two field-editor positions for exhibition reviews in caa.reviews for a four-year term, through June 30, 2012. Each field editor covers a geographic region of the United States; needed now are editors covering art exhibitions in the Northwest and Southeast United States. caa.reviews is an online journal devoted to the peer review of new books, museum exhibitions, and projects relevant to the fields of art history, visual studies, and the arts. Candidates may be artists, art historians, art critics, art educators, curators, or other art professionals; institutional affiliation is not required. Field editors should live in the region covered. Each field editor commissions reviews of important museum and gallery exhibitions for caa.reviews. He or she selects shows to be reviewed, commissions reviewers, determines the appropriate character of the reviews, and works with reviewers to develop manuscripts for publication. These field editors work with the caa.reviews Editorial Board as well as the caa.reviews editor-in-chief and CAA’s staff editor. Each field editor is expected to keep abreast of current and upcoming exhibitions (and other related projects) in his or her geographic region. The Council of Field Editors meets annually at the CAA Annual Conference. Field editors must pay travel and lodging expenses to attend the conference. Candidates must be current CAA members and should not be serving on the editorial board of a competitive journal or on another CAA editorial board or committee. Nominators should ascertain their nominee’s willingness to serve before submitting a name; self-nominations are also welcome. Send a statement describing your interest in and qualifications for appointment, CV, and contact information to: Chair, caa.reviews Editorial Board, CAA, 275 Seventh Ave., 18th Floor, New York, NY 10001. Deadline extended: September 15, 2008. As the current term of the Art Bulletin reviews editor is coming to its conclusion, CAA invites applicants for the next term, July 1, 2009–June 30, 2012 (with service as incoming reviews editor designate from February to June 2009). 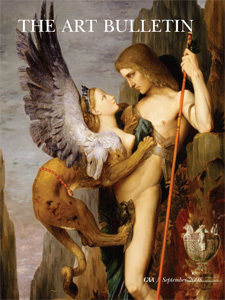 The Art Bulletin, published quarterly by CAA, is the leading publication of art history in English. Candidates should be art scholars with stature in the field and experience in editing book and/or exhibition reviews; institutional affiliation is not required. Candidates should be published authors of at least one book. The reviews editor is responsible for commissioning all book and exhibition reviews in The Art Bulletin. He or she selects books and exhibitions for review, commissions reviewers, and determines the appropriate length and character of reviews. The reviews editor also works with authors and CAA’s director of publications in the development and preparation of review manuscripts for publication. He or she is expected to keep abreast of newly published and important books and recent exhibitions in the fields of art history, criticism, theory, visual studies, and museum publishing. This is a three-year term, which includes membership on the Art Bulletin Editorial Board. The reviews editor attends the three annual meetings of the Art Bulletin Editorial Board—held in the spring and fall in New York and in February at the CAA Annual Conference—and submits an annual report to CAA’s Publications Committee. CAA reimburses the reviews editor for travel and lodging expenses for the spring and fall New York meetings in accordance with its travel policy, but he or she pays these expenses to attend the conference. Candidates must be current CAA members and should not be serving on the editorial board of a competitive journal or on another CAA editorial board or committee. Nominators should ascertain their nominee’s willingness to serve before submitting a name; self-nominations are also welcome. Please send a statement describing your interest in and qualifications for appointment, CV, and at least one letter of recommendation to: Director of Publications, Art Bulletin Reviews Editor Search, CAA, 275 Seventh Ave., 18th Floor, New York, NY 10001. Deadline: September 15, 2008; finalists will be interviewed on October 24, 2008, in New York. CAA offers Annual Conference travel grants to graduate students in art history and studio art and to international artists and scholars. The grants are funded by donations from the contribution check-off on the CAA membership form. CAA warmly thanks those members who made voluntary contributions to this fund. This $150 grant is awarded to advanced PhD and MFA graduate students as partial reimbursement of expenses for travel to the 2009 Annual Conference in Los Angeles. To qualify for the grant, students must be current CAA members. Candidates should include a completed application form, a brief statement by the student stipulating that he or she has no external support for travel to the conference, and a letter of support from the student’s adviser or head of department. For application forms and more information, please contact Lauren Stark at 212-691-1051, ext. 248, or lstark@collegeart.org. Send application materials to: Lauren Stark, Graduate Student Conference Travel Grant, CAA, 275 Seventh Ave., 18th Floor, New York, NY 10001. Deadline: September 26, 2008. CAA presents a $500 grant to artists or scholars from outside the United States as partial reimbursement of expenses for travel to the 2009 Annual Conference in Los Angeles. To qualify for the grant, applicants must be current CAA members. Candidates should include a completed application form, a brief statement by the applicant stipulating that he or she has no external support for travel to the conference, and two letters of support. For application forms and additional information, please contact Lauren Stark at 212-691-1051, ext. 248, or lstark@collegeart.org. Send materials to: Lauren Stark, International Member Conference Travel Grant, CAA, 275 Seventh Ave., 18th Floor, New York, NY 10001. Deadline: September 26, 2008. Recognize someone who has made extraordinary contributions to the fields of art and art history by nominating him or her for one of twelve CAA Awards for Distinction. Award juries consider your personal letters of recommendation when making their selections. In the letter, state who you are; how you know (of) the nominee; how the nominee and/or his or her work or publication has affected your practice or studies and the pursuit of your career; and why you think this person (or, in a collaboration, these people) deserves to be recognized. We also urge you to contact five to ten colleagues, students, peers, collaborators, and/or coworkers of the nominee to write letters. The different perspectives and anecdotes from multiple letters of nomination provide juries with a clearer picture of the qualities and attributes of the candidates. All nomination campaigns should include one copy of the nominee’s CV (limit: two pages). Nominations for book and exhibition awards should be for authors of books published or works exhibited or staged between September 1, 2007, and August 31, 2008. No more than ten letters per candidate are considered. For more information, please write to Claire Vancik, CAA programs assistant. Deadline: July 31, 2008, for the Morey and Barr awards; August 31, 2008, for all others. CAA welcomes the following people to the editorial boards of its three scholarly journals, and to the caa.reviews Council of Field Editors. Natalie Kampen of Barnard College has joined the Art Bulletin Editorial Board. The Art Journal Editorial Board welcomes Jan Estep, Regis Center for Art at the University of Minnesota; Karin Higa, Japanese American National Museum; and Terence E. Smith, University of Pittsburgh. Laura Auricchio of Parsons the New School for Design has joined the caa.reviews Editorial Board. All members serve four-year terms. caa.reviews welcomes three new field editors, who will serve three-year terms for the journal: Linda Komaroff of the Los Angeles County Museum of Art will commission reviews of books on Islamic art; Marjorie Munsterberg of City College of New York, City University of New York, will commission reviews of books on nineteenth-century art; and Jon Seydl of the Cleveland Museum of Art will commission reviews of exhibitions in the Midwest. CAA holds its 98th Annual Conference in Chicago, Illinois, from Wednesday, February 10, to Saturday, February 13, 2010. The Annual Conference Committee invites session proposals that cover the breadth of current thought and research in art, art and architectural history, theory and criticism, pedagogical issues, museum and curatorial practice, conservation, and developments in technology. Session proposals are accepted through an online submission process at http://conference.collegeart.org/2010. The process of fashioning the conference program is a delicate balancing act. The 2010 program is shaped by four broad submission categories: Historical Studies, Contemporary Issues/Studio Art, Educational and Professional Practices, and Open Forms. Also included in the mix are sessions presented by affiliated societies, CAA committees, and, for balance and programmatic equity, open sessions (which have a broad, inclusive topic or theme). Most program sessions, however, are drawn from submissions by individual members; the committee greatly depends on the participation of the CAA membership in forming the conference. The Annual Conference Committee welcomes session proposals that include the work of established artists and scholars, along with that of younger scholars, emerging and midcareer artists, and graduate students. Particularly welcome are those sessions that highlight interdisciplinary work. Artists are especially encouraged to propose sessions appropriate to dialogue and information exchange relevant to artists. Sessions may bring together scholars and participants in a wide range of fields, including but not limited to: anthropology, history, economics, philosophy, religion, literary theory, and new media. In addition, the committee seeks topics that have not been addressed in recent conferences or areas that have traditionally been underrepresented. Proposals need not conform to traditional panel formats; indeed, experimentation is highly desirable. To this end, CAA presents Open Forms, a session category that encourages the submission of experimental and nontraditional formats (e.g., roundtables, performances, forums, conversations, multimedia presentations, and workshops). Open Forms sessions may be preformed, with participants chosen in advance by session chairs. Please note that these sessions require advance planning by the session chair; apply only if you have the time required to attend to such tasks. Sessions selected by the Annual Conference Committee for the 2010 conference are considered regular program sessions; that is, they are 2½-hours long, are scheduled during the eight regular program time slots during the four days of the conference, and require a conference badge for admission. With the exception of the Open Forms category, CAA session proposals may not be submitted as preformed panels with a list of speakers. Proposals for papers for the 2010 sessions are solicited through the 2010 Call for Participation, published in February 2009. Each CAA affiliated society and CAA committee may submit one proposal that follows the guidelines outlined above. A letter of support from the society or committee must accompany the submission. The Annual Conference Committee considers it, along with the other submissions, on the basis of merit. Below are descriptions of the four general submission categories. Please mail eighteen (18) collated and stapled copies of your entire session-proposal application to the CAA manager of programs (mailing address appears at the end of the article). Do not use paper clips. The Annual Conference Committee makes its selection solely on the basis of merit. Where proposals overlap, CAA reserves the right to select the most considered version or, in some cases, to suggest a fusion of two or more versions from among the proposals submitted. The submission process must be completed online. Eighteen printed, stapled, and collated copies of your completed application must be sent by mail to: Manager of Programs, Sessions 2010, CAA, 275 Seventh Ave., 18th Floor, New York, NY 10001. Deadline: September 1, 2008; no late applications are accepted. For questions, please contact Susan DeSeyn-Lodise, CAA sessions coordinator.